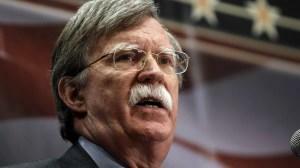 US national security adviser John Bolton has advised President Trump to abandon the 1987 intermediate-range nuclear forces treaty with Russia after the Kremlin rolled out a nuclear-tipped cruise missile earlier this year in violation of the agreement. No wonder they needed all that uranium! While the basis for Bolton's recommendation is Russia's new 9M729 ground-launched cruise missile, Russian President Vladimir Putin claimed in March to have a nuclear-powered, nuclear-tipped drone that can't be shot down and is always lurking. Meanwhile, Russia has been working on hypersonic weapons technology said to be on track for war by 2020, according to CNBC, which reported in May that that Moscow successfully tested a nuclear-capable hypersonic glide vehicle in 2016. Sources said a third test was completed in October 2017 and resulted in a mishap seconds before obliterating its target. According to The Guardian, Bolton issued a recommendation that the US withdraw from the treaty is awaiting cabinet agreement, and has reportedly come under fire by "forces within the state department and Pentagon." A Monday meeting at the White House to discuss the matter was postponed. In short, Bolton doesn't think that the United States should remain in an agreement that Russia begrudgingly signed at the end of the Cold War, and is currently using as toilet paper. When the idea was floated to European Allies this week, the UK was apparently "alarmed," as they view the INF as an "important arms control pillar" marking the end of the 1980s nuclear standoff "pitting US Pershing and cruise missiles against the Soviet Union’s SS-20 medium-range missiles," according to the report. Bolton's idea is apparently in its early stages, as "The US has started to brief allies with the possibility of withdrawal. But I don’t believe there has been any kind of interagency process in the administration," according to Jon Wolfsthal, a former senior director for non-proliferation and arms control at the NSC. In February, the Trump administration released the Nuclear Posture Review, which recommended that the US devote resources to the creation of ground-launched medium-range missiles in order to pressure Moscow to return to compliance with the INF. The report was published prior to Bolton's arrival at the White House. Bolton, meanwhile, is said to have blocked a September dialogue with Russia over strategic stability, "led on the US side by Andrea Thompson, the under secretary for arms control at the state department and the Russian deputy foreign minister, Sergei Ryabkov" according to The Guardian. Appartently Bolton was to meet with his Russian counterpart, Nikolai Patrushev in Geneva in August in order to give his go-ahead on the dialogue between the two countries, however Bolton is said to have blocked it. Bolton will travel to Moscow next week, where he may meet with Putin. On Thursday, Putin appeared to try and get ahead of the coming conflict over the INF, announcing that Russia would adhere to a "no first use" policy on nuclear weapons. "We have no concept of a pre-emptive strike," Putin told a conference. "[W]e expect to be struck by nuclear weapons, but we will not use them first." US Defense Secretary James Mattis, however, made it crystal clear that all options were on the table when it comes to Washington's response to Russian violations. "Our discussions here were to ensure that we answered all questions that any of the nations had, and that we look at what options do we have, and to make certain that all the nations had input to me as I go into the discussions in Washington," said Mattis, adding "This will be a decision obviously made in concert with our allies by the president, and we’ll take it from there." Critics of Bolton's proposal to abandon the INF have suggested that it would hand a "propaganda victory" to Moscow, and is "premature before any detailed negotiations between US and Russian specialists" have a chance to explore diplomatic solutions. Alexandra Bell, a former senior arms control official at the state department, now at the Centre for Arms Control and Non-Proliferation, said that in informal, “track two” discussions, Russian arms control experts suggested Moscow might be ready for a compromise to salvage the INF. “You should be able to get somewhere with the Russians, but Bolton doesn’t seem interested,” Bell said. The primary argument against the US pulling out seems to be that it would embolden Russia to aggressively expand its nuclear arsenal. Bolton, however, is arguing that they already have - and perhaps we look silly holding up our end of the bargain.